There are many MIDI commands that control the functions of the Traktor decks, for example the Play/Pause or the Filter command. In earlier Traktor versions the list Assignment was used to configure the deck that is to receive the command. Here the options Deck A to Deck D and Focus were available. 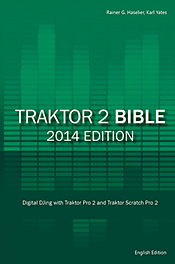 To make the mapping of two identical controllers easier the Assignment concept was changed in Traktor 1.2. Let’s assume that you use two CDJ-400 in HID mode; one CD player shall control deck A, the second one deck B. Create a new logical controller of type CDJ-400 and add a comment to the controller name, like CDJ-A. Open the list Device Target and select Deck A. Open the list In-Port and select the HID-Port of the first CDJ-400. 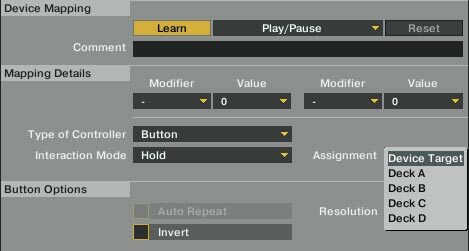 Add the MIDI commands you need. Map them with the learn feature to the controls of the CDJ-400. When the command is deck specific open the list Assignment in section Mapping Details and choose Device Target. When this option is selected the command will be sent to the deck configured in step 2. Once the mapping for the first CDJ is ready, create a duplicate. Change the comment for the duplicated mapping into CDJ-B, for example. Make sure that the controller duplicate is selected in list box Device. Use the list box In-Port and assign the HID port of the second CDJ player to the device. Open the list box Device Target and select Deck B. Because the assignment Device Target was used for all deck specific commands in step 3, the mapping for the second CDJ player is already setup with this step. Despite the Device Target extension it is still possible to hard-wire the target deck for a MIDI command in Traktor 1.2. This is done by selecting Deck A to Deck D in the Assignment list box. When a deck is selected here the command is always sent to this deck no matter what setting has been made in the Device Target list of section Device Setup. It is still possible to use the deck focus (the letter of the deck that currently has the input focus highlighted) to set the target deck. To do this select Focus in list Device Target of section Device Setup. Then for all commands that are to be sent to the deck with the input focus select the option Device Target in the list Assignment of section Mapping Details. Assignment options are summarized in the following table.